The irony of Ireri’s case is that without her “civil disobedience, resisting arrest, obstruction of traffic and reckless conduct”–along with those of countless immigrant youth in the years leading up to the Obama administration finally acting in June 2012–there would be no DACA program in the first place. Unzueta Carrasco is now suing. The massive March “mega-march” in Chicago was repeated in cities around the country, culminating in a massive national mobilization on May Day 2006 all over the U.S. The right-wing Sensenbrenner bill was defeated. The movement for immigrant justice unleashed in the spring of 2006 utilized all types of political action–from massive protests to civil disobedience–with the aim of winning amnesty for more than 11 million immigrant workers. Obama was a beneficiary of this activism–he won a huge majority of votes from immigrants who believed his election would lead to immigration reform, especially with Democrats winning a majority in both houses of Congress. But as the Democrats showed themselves unwilling to use their political power to push for immigration reform–and as Obama took his first steps toward earning his current title of Deporter-in-Chief–a section of the immigrant rights movement, particularly the undocumented youth in the country not by their choice, but brought in by their parents–began to grow impatient. In 2009, a group of undocumented youth came together in Chicago to address the Obama administration’s stalling. They formed the Immigrant Youth Justice League (IYJL). In March 2010, the group staged a Coming Out of the Shadows rally to commemorate the fourth anniversary of the mega-marches, but also to provide a new direction for the movement–one led from the bottom up by undocumented immigrants who were putting themselves in the spotlight. EVENTUALLY, THE IYJL, and other emerging youth groups around the country inspired by it, became leading proponents of the DREAM Act [the Development, Relief and Education for Alien Minors Act]–but not without opposition from Democrats and mainstream liberals who thought that the youth’s independent direction and action could upset attempts to pass Comprehensive Immigration Reform (CIR). On the left, some also abstained from supporting the bill because it included a provision offering legal status in exchange for military service. Unzueta Carrasco, holding a banner that read “Undocumented and Unafraid, DREAM Act Now” was one of them. She was arrested but not prosecuted. In mid-June 2012, President Obama announced that undocumented youth could apply for DACA, giving them a temporary relieve from deportation and work permits, but they would have to comply with a long list of requirements. 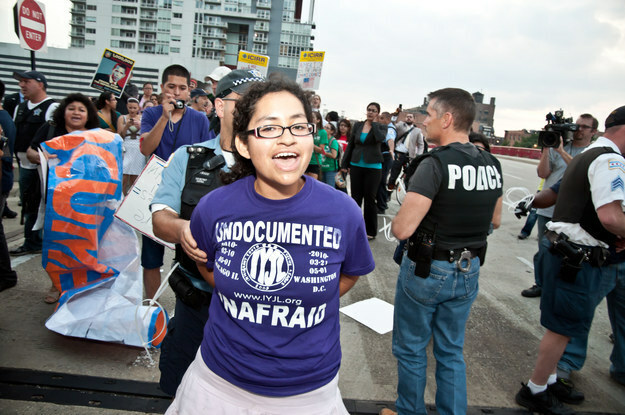 Sol Ireri’s other instances of civil disobedience cited by the USCIS include in 2011, when she was part of a group protesting the use of local police in immigration matters in Chicago; in September 2012, when a group of undocumented youth engaged in a sit-in outside the Democratic National Convention in North Carolina; and in May 2013, during a protest of Obama in Chicago. Ms. Unzueta Carrasco had volunteered for [Obama’s] senatorial campaign while in high school, and was disappointed at the high number of deportations under his administration, including many people whom she knew. Ms. Unzueta Carrasco and a group of individuals blocked Michigan Avenue, connected to each other and sitting in a circle. Civil disobedience actions, a tactic of nonviolent protest, are viewed as acts of conscience and remain a cornerstone of American social reforms and democracy. It is deeply troubling that in the decision over Ms. Unzueta Carrasco’s DACA renewal DHS views civil disobedience as a public safety concern, and not as protected First Amendment activity. Nadia Sol Ireri Unzueta Carrasco has demonstrated to the people she met in this country that she is a hero, not a “threat to public safety.” She came to the U.S. in 1994, when she was 6 years old, and has lived in the U.S. for the last 22 years of her life. She graduated from high school and college. She enrolled at the University of Illinois at Chicago (UIC), studying at the UIC Honors College, from where she graduated with the highest distinctions in her department. She isn’t only an activist for justice, but also works for the extracurricular After School Matters program in Chicago. Thousands of educators are signing a letter in support of her not only because they want to see justice done, but because Sol Ireri is the type of person who should be recognized for helping to bring change for millions of people–not retaliated against by a vindictive administration shamed by her actions.